The High Speed HDMI AOC is the perfect solution for extending HDMI signals in classrooms, conference rooms, healthcare facilities, houses of worship and other commercial environments. Utilizing AOC technology that performs similar to traditional copper cabling, the optical fiber construction between the connectors provides optimum performance and easy installation. The AOC technology delivers several advantages which make it a smart choice in select installations. The cable diameter is smaller than copper and more flexible which makes it easier to install in tight spaces. Constructed from fiber strands, this cable reduces the risk of EMI/RFI so performance is stable when used in typically high interference environments such as data centers, surgical theaters or manufacturing facilities where high resolution and consistent display are critical. The AOC draws power from the HDMI source device, so no external power source is required. Combine the AOC with wall plates for a clean, professional connectivity solution that can be used with projectors in classrooms, conference rooms or training rooms. Both the source device and display must support a HDMI feature in order to pass that feature through this cable. Note: If the HDMI signal is being extended from an Acer Chromebook C738T, use an alternative solution, like the Long Length HDMI Cables, Active High Speed HDMI Cables, or HDMI over Cat5 Extenders. 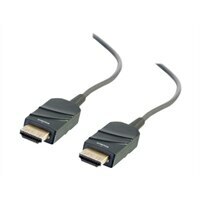 C2G has confirmed that there are performance challenges when using High Speed HDMI Active Optical Cables in conjunction with an Acer Chromebook C738T.